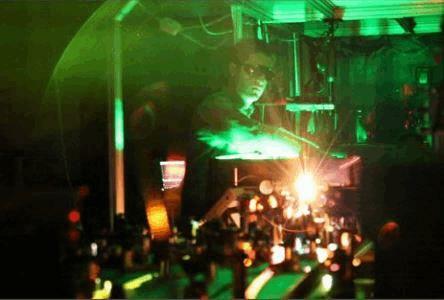 UNM Research Assistant Aram Gragossian tests lasers in one of the Department of Physics & Astronomy's optics laboratories. Image courtesy of University New Mexico. Researchers at the University of New Mexico (UNM) have successfully created the world’s first all-solid-state cryocooler device at sub-100 K temperatures, which, if developed further, could have myriad applications. Optical refrigeration – the cooling of solids with lasers – was first demonstrated in 1995 and over the past twenty years has been refined by scientists to achieve increasingly lower cryogenic temperatures (<123 K). In 2010, laser cooling to as low as 114 K was demonstrated. Now, the team at UNM’s Department of Physics & Astronomy have pushed another milestone, achieving the lowest temperature ever recorded using an all-solid-state cryocooler, 91 K or -296 Fahrenheit, a mark previously achievable only by using liquid nitrogen or helium. Through pump laser absorption enhancement, thermal management, and utilization of high-purity synthetic crystals, (specifically, a YLF:10 percent (Ytterbium) Yb3+ crystal grown by the Czochralski method), the researchers built the world's first solid-state cryocooler – a compact device with no moving parts. Such technology could be used to cool components that require constant and reliable cooling, like infrared detectors on satellites. “Examples of such applications that benefit immediately from this technology range from reducing dark current in space-borne IR and gamma-ray sensors to cooling reference cavities for ultra-stable lasers,” added the scientists in their paper, published in the journal Nature. The UNM group is working with the National Institute of Standards and Technology (NIST) to use these ultra-stable lasers to operate high precision clocks in metrology applications. Solid-state cryocoolers also can be used to cool infrared focal plane arrays (cameras), which can be used for a variety of applications, such as providing vibration-free detectors that can more accurately differentiate healthy skin from cancerous growths. More applications across industries will be possible when the researchers successfully achieve even colder temperatures with their cryocooler device — ideally, inside a planned $65 million Physics, Astronomy & Interdisciplinary Science (PAIS) lab equipped to conduct more advanced experiments. Newer iterations of the device should be more efficient through the use of even higher-purity crystals and enhanced pump light absorption. “Since it was determined in this work that enhanced pump light is necessary to achieve lower temperatures, the next most promising step is to further enhance laser trapping by exploiting an astigmatic Herriott cell. This will provide an estimated increase of incident pump light absorption from 39% to >90% at low temperatures, both removing the need for manual temperature reduction of the clamshell and increasing the heat load capacity for an all solid-state optical cryo-cooler,” the scientists wrote in the journal. Last year, another method to cool solids using light, referred to as Raman scattering, was successfully demonstrated by researchers at the University of Illinois, who cooled a transparent material patterned into a photonic crystal (a periodic array of nanoscale holes) by beaming specific laser wavelengths.